Now that the majority of the long offseason is behind us and preseason hockey is just around the corner, more and more masks for the new season are being revealed. With many goaltenders switching teams over the busy summer or just looking to mix up their style, we’ve had a bevy of buckets to look at so far, and more are sure to come. If you missed parts one and two of our breakdown, catch up before checking out the latest reveals, and stay tuned the rest of the summer as we review even more new buckets. Winnipeg netminder Michael Hutchinson is clearly a fan of minimalist design when it comes to his masks, as evidenced by the clean and graphic aesthetic he’s sported since joining the club. Working once again with artist David Leroux, Hutch’s mask has been stripped of red entirely this year, aligning more with the team’s all blue and white unis. 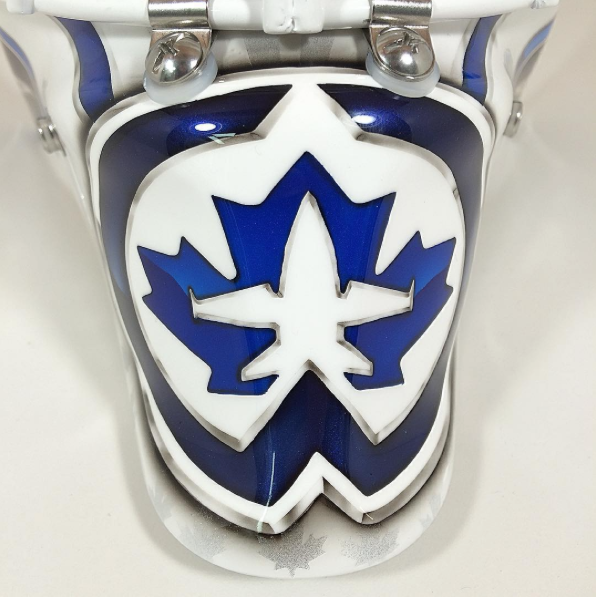 The perfectly symmetrical design has a modified version of the Jets’ primary logo on the chin with a large blue and silver plane flying over the top of the mask. Each side has an abstract wing design, angled upwards and framing the jet in the center. Not unlike last year’s design, this mask has a wonderfully bold, graphic quality while also paying great attention to detail. Around the logo on the chin and in the dark portions of the fighter jet are small maple leaves, creating a wallpaper-like pattern and adding some visual interest to the large fields of solid color. Leroux consistently delivers high-quality work in this signature style, and while the absence of red makes this iteration lose some of its pop, the overall design is a real beauty. 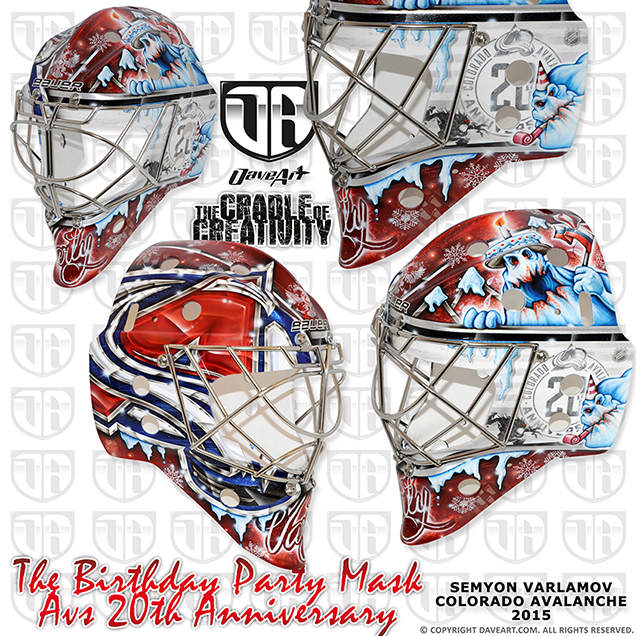 It’s the yeti’s birthday, and he’s celebrating all over Semyon Varlamov’s new mask. In honor of the Avs’ 20th anniversary, artist Dave Gunnarsson created an arctic birthday bash scene complete with candles and party hats for Varly’s 5th season in Colorado. 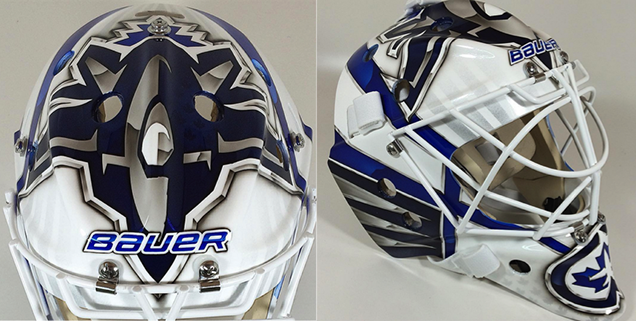 “Semyon Varlamov was sure what he wanted on his new Colorado Avalanche mask,” Gunnarsson explains on Instagram. “[the] Avalanche celebrates 20 years Anniversary this year, so Varly wanted to pay tribute to that on his new mask.” The yeti peeking over the top also pays homage to Varlamov’s home country, holding a Russian flag and a balloon shaped like the top of Saint Basil’s Cathedral in Moscow. Opposite from the snow-capped mountains and celebration scene sits a chromed-out Avs logo that fills the space of the entire right side of the mask. As with all of Gunnarsson’s work, the prolific artist does an excellent job of seamlessly combining multiple themes and styles into one piece. This playful design is a comical yet beautifully executed celebration of the Avs’ franchise and will be fun to watch out on the ice this season. Making the move to Philadelphia in the offseason, the former Capitals, Sabres and Islanders goaltender decided to change things up and pay homage to his new city with his mask. Having sported everything in the past from lighthouses to buffalo hide, Neuvirth went a more cinematic route this year with an orange Rocky-themed bucket. Painted by Neuvirth’s long-time artist, Dave Gunnarsson, this design is jam packed with scenes from the movie, metallic sparkle, light flares and too many Flyers logos to count. 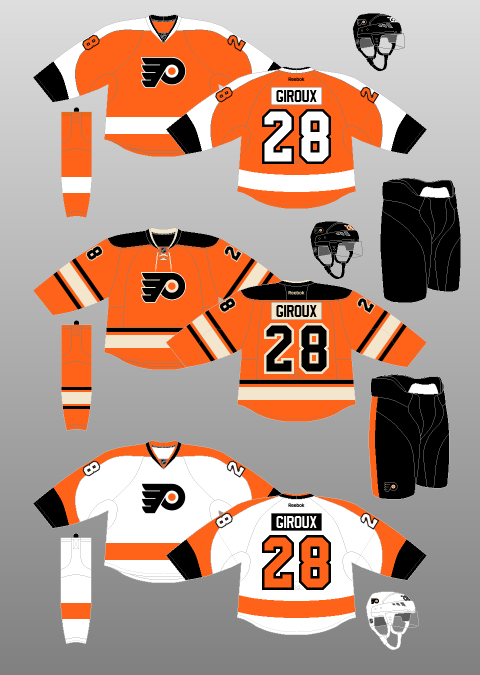 Despite the paint job being incredibly detailed and busy, Gunnarsson has blocked around each of the scenes with white frames and black trim, creating some order in the otherwise sensory overload and also mimicking the Flyers’ home jerseys. The minimalistic color scheme also works well here, grounding the variety of imagery and giving it some cohesiveness. Like with many other super-detailed masks, the subtleties often get overlooked when it’s actually on the ice, but Gunnarsson has done a nice job overall of creating a cohesive design here that fuses the team brand with the film. If you feel like you’ve already seen a new Cam Talbot Ghostbusters mask this year, you are correct. The new Edmonton Oiler worked with artist David Leroux on a graphic, striped mask earlier this summer that featured a subtle Ghostbusters logo on the backplate. For round two, Talbot commissioned his regular artist, Dave Gunnarsson to create something on the opposite end of the spectrum. There’s nothing crisp or neat about this slime-covered bucket. Gunnarsson himself even stated on his Facebook page that “Slimer is all over the mask, of course in orange color, and he looks more slimy than ever.” Case in point. 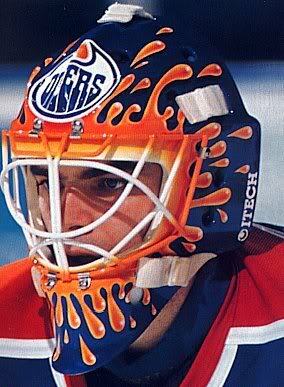 In a play between the film and oily-inspiration, (also perhaps giving a nod to CuJo’s iconic Oilers look) Gunnarsson created an almost entirely orange mask with Slimer’s mouth becoming the opening in the middle. The eyes and teeth are treated with his signature GLOW Tech FX paint, as are the Ghostbusters logos on each side. The small, blue background areas are filled with tiny holographic oil drops and NHL shields, continuing to tie in the Edmonton and league identities. 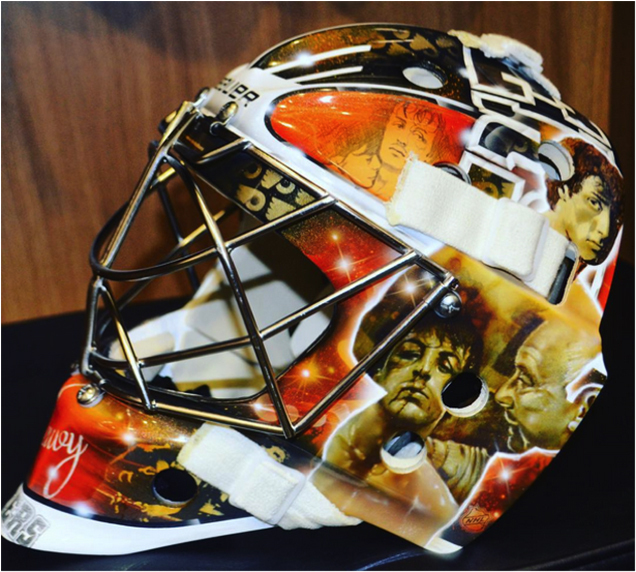 While this mask is the polar opposite of what Leroux made for Talbot, both are extremely well executed and unique interpretations of what’s clearly one of the netminder’s favorite films. It’s great to see one goaltender sport two drastically different styles in one season, so Talbot will certainly be a fun one to watch! 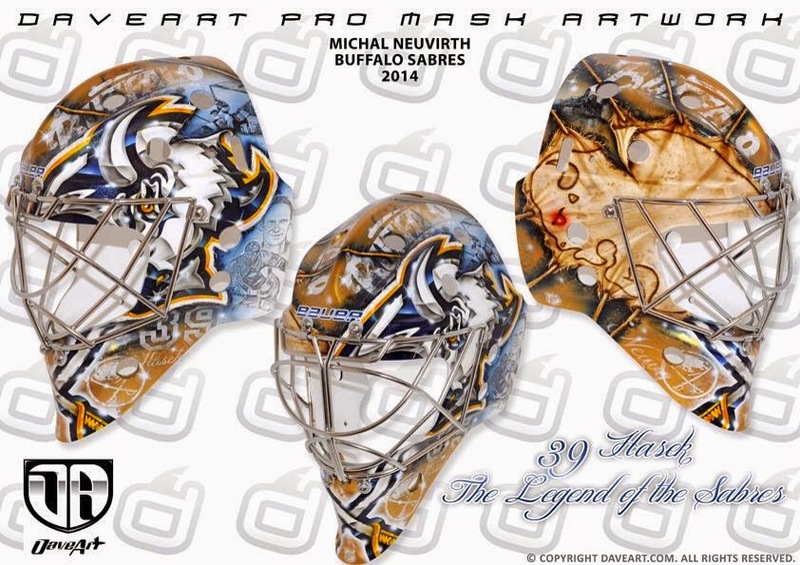 Holtby once again teamed up with his long-time artist, Dave Gunnarsson, to create another star-spangled mask. 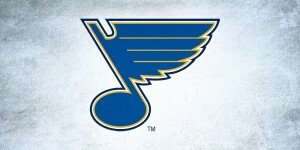 This year’s design features the new Caps wordmark along each side with massive blue and red stars strung above. 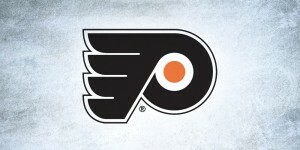 The old team logo sits behind in gray, adding some visual interest in the background. This mask being predominately white has its pros and cons. As Gunnarsson said, it adds a nice retro flair and gives a nod to the days preceding flashy mask paint jobs, but it’s still often nice to have more color on a mask to provide contrast with road jerseys and the rink. 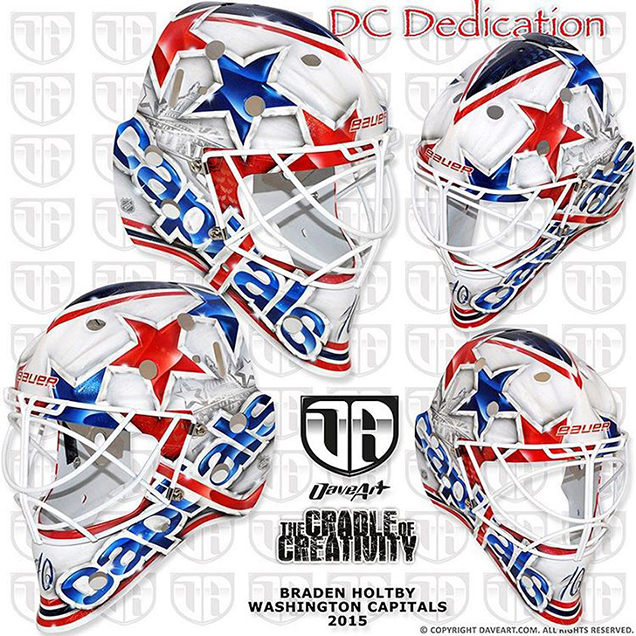 Concerns of being washed out aside, this design is really clean and classic; a nice addition to Holtby’s already prolific collection of patriotic buckets. 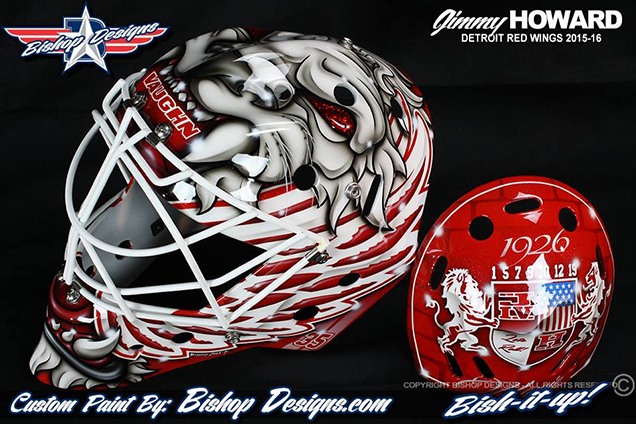 In a seemingly drastic departure from his historically consistent designs – last year sporting a simple all-red bucket with wings on either side and a ‘D’ crest on top – Howard’s go-to artist Ray Bishop gave the Detroit netminder a pretty ferocious looking paint job for the new season. Still keeping the core design elements Howie loves like the wings and red brick backplate in place, Bishop painted a gargoyle-esque lion with glowing red eyes over almost the entire top of the mask. In my opinion, this is the perfect amount of departure for Jimmy after multiple seasons of wearing very similar designs. 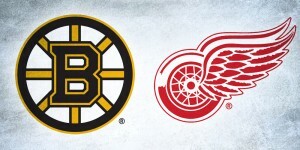 Working with an original six franchise like the Red Wings who have made only the most minimal changes to their logo over the team’s long history, it makes sense to adhere to a consistent and classic look. Bishop has done a great job here in keeping the core design aesthetic that Howie is now known for but adding a sophisticated element of surprise to keep things fresh and interesting. As more goalie masks for the new season are announced, we’ll be showcasing them. Make sure to come back and check it out!